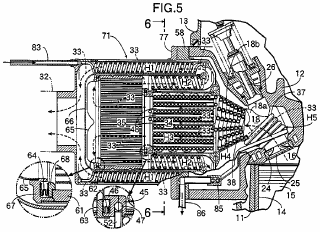 Honda has received a patent on an exhaust heat exchanger that harnesses the heat energy from the exhaust through a thermal exchange, which can then be converted into electrical energy through a thermal electric process or to drive a turbine/generator. First heat exchangers (H4, H3, H2) are disposed within an exhaust port (18), within a pre-catalytic device (34), and on the downstream of a main catalytic device (35); the exhaust port (18), the pre-catalytic device (34), and the main catalytic device (35) being provided in each exhaust passage (33) of a multicylinder internal combustion engine. These first heat exchangers (H4, H3, H2) are independently provided for each of the exhaust passages (33), and a second heat exchanger (H1) is disposed in a section where these exhaust passages (33) are combined. Since the first heat exchangers (H4, H3, H2) are disposed on the upstream side of the exhaust passage (33), high heat exchange efficiency can be obtained by high temperature exhaust gas, and, moreover, the occurrence of exhaust interference can be avoided, thereby preventing any decrease in the output of the internal combustion engine. Furthermore, since the second heat exchanger (H1) is disposed in the section where the exhaust passages (33) are combined, the exhaust gas in which pulsations have disappeared as a result of the flows being combined can be made to act on the second heat exchanger (H1), thereby enhancing the heat exchange efficiency. Do you know that, Honda has a patent of Transforming Exhaust Heat energy into electricity to increase engine efficiency? Wow what a good idea. Using this device we can generate electricity to reduce alternator load and indirecty reduce engine load. Actually as you may aware that, Air-con did put up load to engine and by removing it, for sure it will help to increase engine performance. Don't know when can I see the first production car with this technology from Honda.